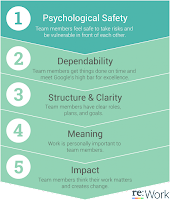 Members of Google's HR department conducted a two year study to find an answer to the question: What makes a Google team effective? 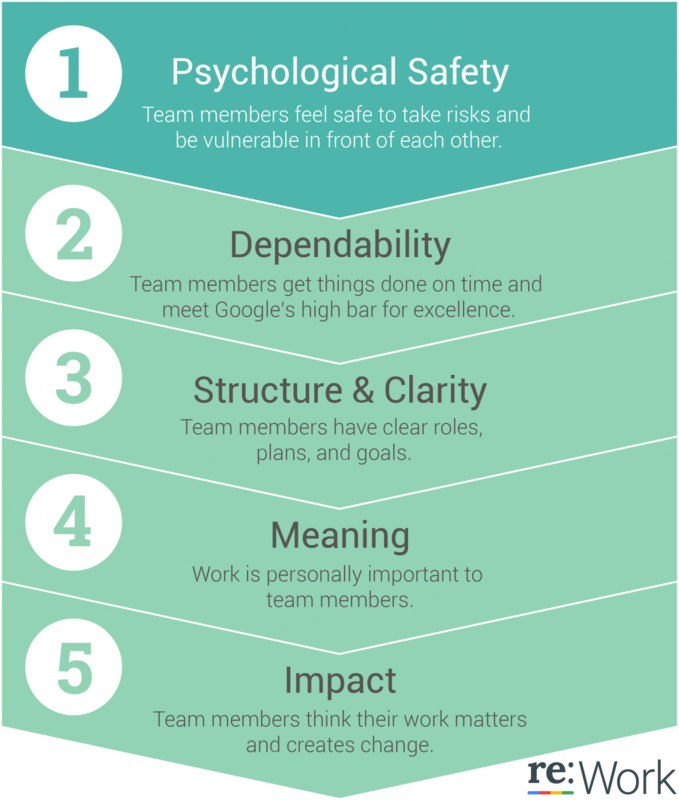 They conducted over 200 interviews and analyzed 250 characteristics of more than 180 teams at Google (see here). They expected that the answer to the question would lie in the combinations of individual traits and skills of the team members. But they found a very different answer. Of these 5 characteristics number 1 came out as by far the most important. My thoughts: to start, I must say that the articles about this study do no share any details about the methodology followed. Therefore I cannot say much about how credible the findings are. A second thought is that I find it interesting that these findings do not point at the individual level as the key to team effectiveness but to the team level. This supports my belief that too often we look for causes of success and failure within individuals instead of situations and structures. Much psychological research has shown that situations and structures have a much stronger influence on our behavior that we think and that the influence of factors within the person is generally overrated. A third thought is that I find the content of the findings interesting. The characteristics show the great importance of, let me paraphrase it bit here, having a clear idea about what you are doing and being motivated for what you are doing within a supportive work environment. Excellent article & glad to see you prompt us to look beyond personal traits as a recipe for success. Human Systems need something more to create the magic.